In this piece from Mountaineer magazine, Mountaineers Books guidebook author Craig Romano reflects on what it meant to him to grow up in the outdoors, and the importance of giving this gift to others. I was born in Bridgeport, Connecticut; the largest city in one of the country’s most densely populated states. Located 50 miles east of New York City, Bridgeport was an industrial powerhouse from the late 1800s to just after World War II. The city attracted waves of immigrants and was, and still is, incredibly diverse. I lived in the city’s Little Italy neighborhood where Italian and Yiddish were freely spoken. I remember a lot of little old ladies in black dresses. My parents were not outdoorspeople, nor were my friends. My neighborhood of tightly-packed two and three family homes was no Walden Pond. The city began to go into decline in the 1960s, and many of the sons and daughters of the immigrants and others who came to this city for the American dream began fleeing to greener pastures. My family was among them, and we literally left for a greener pasture. In the summer of 1969 we relocated to a small town in Southern New Hampshire with a population of 3,000. I no longer walked four city blocks to go to school. I now took a bus three miles to the only school in town. On those bus rides I stared out at what seemingly appeared to be infinite tracts of forest, wetlands, fields, and opportunities for outdoor discovery. While most children have a hard time moving and adjusting to a new environment, this 8 year old hit the lifestyle jackpot. Thanks to my mother, I was introduced to the natural world as a very young child through visits to nature centers and sanctuaries just outside of the city. I knew then, I didn’t want to live in the city. I wanted to live in the country and have a lifestyle influenced and inspired by the natural world. I spent much of my preteen years exploring old woods roads that traversed my rural town; roads which my father dubbed hunter’s trails in a state he dubbed God’s Country. Indeed it was, as I was in heaven in my environment of pine groves, oak flats, maple swamps, and rolling hills. I spent lazy summer days in mosquito-swarming wetlands catching frogs, toads, salamanders, turtles, and snakes. During warm, hazy summer evenings, I was mesmerized by June bugs invading the porch, bats raiding the backyard, woodcocks spiraling into the sky, and deafening ensembles of chorus frogs. Every trip into the forest – every evening outside – provided me with hours of enlightenment and a constant yearning to learn more about the natural world and my relationship with it. I became a Cub Scout, then Boy Scout. These organizations introduced me to canoeing, camping, and backpacking. Although I’d already dabbled in a little hiking (lots if you count the miles and hours spent traipsing the old woods roads), the Scouts gave me my first taste of more serious hiking with treks up some of southern New Hampshire’s iconic mountains. I religiously read Boys Life magazine, which only fueled my wanderlust to explore the natural world. Some of my fondest outdoor memories stem from the week long scout camping jamboree at the Hidden Valley Scout Reservation in New Hampshire’s Lakes Region. The largest scout camp in New England, Hidden Valley, contains several mountains, lakes, and miles of trails. Hidden Valley gave me my first taste of backpacking or, as we called it at camp, an outing. We set up camp on a forested glade above Upper Round Pond. We were several miles from any roads or villages – but in our minds we were deep in the wilderness. Wilderness is as much a state of mind as it is a physical place. Huddled around a campfire, we shared songs and lore. Retiring for the evening, we tried to assuage our minds that Old Man Shannon – the disgruntled axe-wielding logger that hated Boy Scouts because he lost his land to them – was a camp legend and not a historical reality. It’s hard for me to now fathom that my first “outing” was more than 45 years ago. And was it really 50 years ago this summer that my family moved to a small town in New Hampshire, a move which was responsible for my transformation to a fulltime devotee to all things natural and wild? While my love for nature and a lifetime devoted to healthy outdoor living has at times been a selfish devotion, I am now fervent in spreading the word. I know guidance, life choices, nudging, and fate has all led me to a life that’s as near to complete satisfaction as possible. The journey continues and I am content. I have never doubted that I am figuratively, and many times literally, on the right path. The health of the planet and the spiritual health of individuals drives me to advocate for wilderness and for a life devoted to the outdoors, one that values outdoor experiences and reverence to nature over the pursuit of material and non-sustainable consumption. 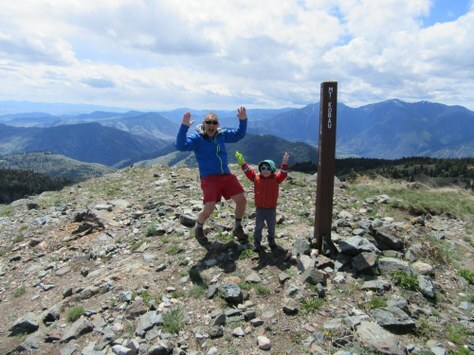 I’m raising my son to respect the natural world and to embrace a healthy lifestyle of outdoors pursuits. But I am well aware that many sons and daughters do not have a parent, guardian, mentor, or community to guide them to a similar lifestyle. To those of us enlightened to the wonders of nature and blessed with an upbringing versed in the outdoors, we have a moral obligation to share our guidance and perhaps provide a little nudging as well. We know what a difference it has made in our lives and we understand what a difference it can make for others as well as for the future well-being of our planet and all of its denizens. There are many forces, temptations, and illusions working against us. So get to work spreading the word, leading the way, setting the example, and reaping the benefits of a life immersed in the outdoors. Craig Romano is an award winning author who has written and co-written more than 20 books. His latest release, Urban Trails Everett (Mountaineers Books) highlights the best trails for walking, running, and hiking in Western Snohomish County, as well as Camano and Whidbey Island. Some of his other titles include Urban Trails Seattle, 100 Classic Hikes Washington, and Day Hiking Olympic Peninsula (2nd edition).